At the ongoing MWC 2017 event, Nokia today launched the rumored three new device called Nokia 3, Nokia 5 and the Nokia 3310 feature phone. The company also announced the global availability of the Nokia 6 smartphone that was launched at CES event this year. The Nokia 5 is priced at 189 Euros and will be available in Q2 in single and Dual SIM options. 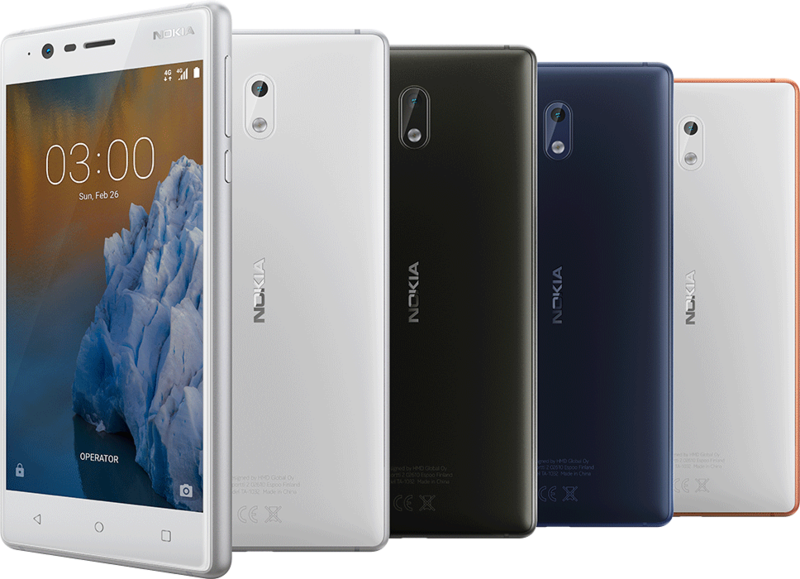 The Nokia 3 is priced at 139 Euros (around $146) and will be available from Q2 2017 with Silver White, Matte Black, Tempered Blue and Copper White color options. 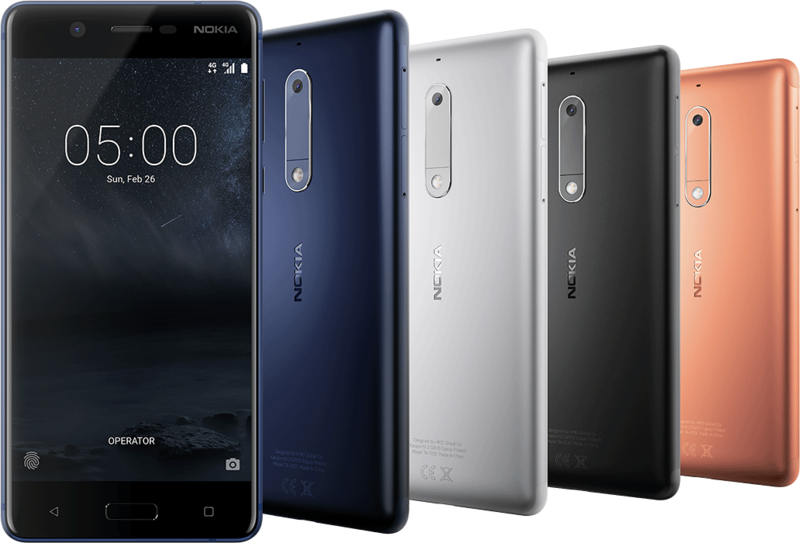 The Nokia 6 will be priced at 229 Euros (around $241) with Matte Black, Tempered Blue, Silver and Copper color options. 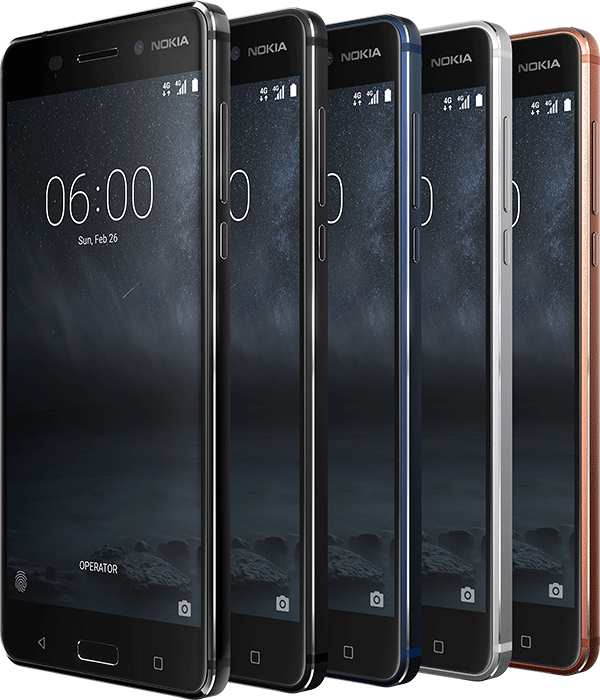 The special edition of the Nokia 6 will be available in Arte Black color option with 4GB RAM and 64GB inbuilt storage and will be priced at 299 Euros (around $315) with availability starting Q2 2017 globally. 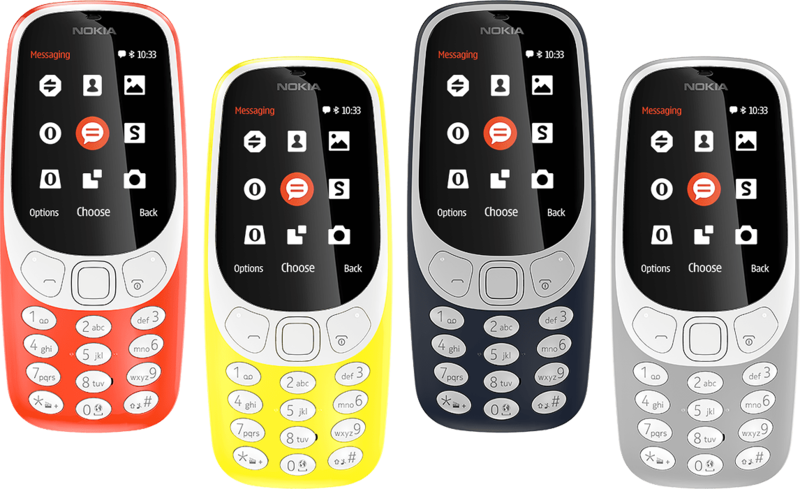 The feature phone Nokia 3310 will be priced at 49 Euros and will also be available in Q2 2017.
octa-core Qualcomm Snapdragon 430 ( 4 x 1.2 GHz Cortex A53 + 4 x 1.5 GHz Cortex A53) 64-bit processor with Adreno 505 GPU and has 2GB of LPDDR3 RAM with 16GB internal storage capacity and MicroSD card expandable storage up to 128GB. It runs on the Android 7.1.1 Nougat OS and supports Dual-SIM. It features a 13-megapixel rear camera with dual-tone LED flash, PDAF, 1.12um sensor, f/2.0 aperture and an 8-megapixel front-facing camera with 1.12um sensor, f/2.0 aperture and 84˚ wide-angle lens. A 3000mAh built-in battery is available and we also have a fingerprint sensor on front physical home button. It comes with 4G LTE, WiFi 802.11 b/g/n, Bluetooth 4.1, GPS and USB OTG connectivity options. We also have a 3.5mm audio jack, a speaker, smart amplifier TFA9891 and Dolby Atmos. It measures 149.7 x 72.5 x 8.55 mm. The Nokia 3 features a 5-inch HD 2.5D sculpted Corning Gorilla Glass display, 1280 x 720 pixels resolution and 450 nits brightness. It is powered by a 1.3GHz quad-core MediaTek MT6737 64-bit Processor with Mali T720 MP1 GPU. It has 2GB RAM and 16GB internal storage and microSD card expandable storage up to 128GB. it runs on the Android 7.0 (Nougat) OS out of the box and supports Dual-SIM and single SIM capabilities. It features an 8-megapixel autofocus rear camera with LED Flash, f/2.0 aperture, 1.12um pixel size and an 8-megapixel autofocus front-facing camera, f/2.0 aperture and 1.12um pixel size. It is backed up by a 2650mAh battery and 4G LTE, WiFi 802.11 b/g/n, Bluetooth 4.0, GPS connectivity options. It also has a 3.5mm audio jack and FM Radio support. It measures 143.4 x 71.4 x 8.48 mm. The Nokia 6 will be available globally with 5.5-inch 2.5D curved glass display with 450 nits brightness, Corning Gorilla Glass 3 protection and 1920 x 1080 pixels resolution. Its powered by a octa-core Qualcomm Snapdragon 430 ( 4 x 1.2 GHz Cortex A53 + 4 x 1.5 GHz Cortex A53) 64-bit processor with Adreno 505 GPU and comes with 3GB / 4GB of LPDDR3 RAM with 32GB / 64GB internal storage capacity and MicroSD card expandable storage up to 128GB. It runs on Android 7.1.1 (Nougat) OS out of the box and supports Dual SIM. It features a 16-megapixel rear camera with dual-tone LED flash, PDAF, 1.0um sensor, f/2.0 aperture and an 8-megapixel camera is available on front with 1.12um sensor, f/2.0 aperture and a 84˚ wide-angle lens. A 3000mAh built-in battery comes with 4G LTE, WiFi 802.11 b/g/n, Bluetooth 4.1, GPS, USB OTG connectivity options and additional features includes 3.5mm audio jack, Dual speakers, Dual smart amplifiers (TFA9891) and Dolby Atmos. A fingerprint sensor is available on the physical home button on front. It measures 154 x 75.8 x 7.8 mm. The only launched feature phone by Nokia, the Nokia 3310 comes with 2.4-inch curved display with polarized layer and it has 16MB internal storage with MicroSD card expandable storage up to 32GB. It features a 2-megapixel rear camera and has a 1200 mAh removable battery. We has 2G connectivity and Single-SIM + Dual-SIM support with FM Radio, MP3 Player, Bluetooth 3.0 options as well. It runs on the Nokia Series 30+ OS and measures 15.6 x 51 x 12.8 mm.